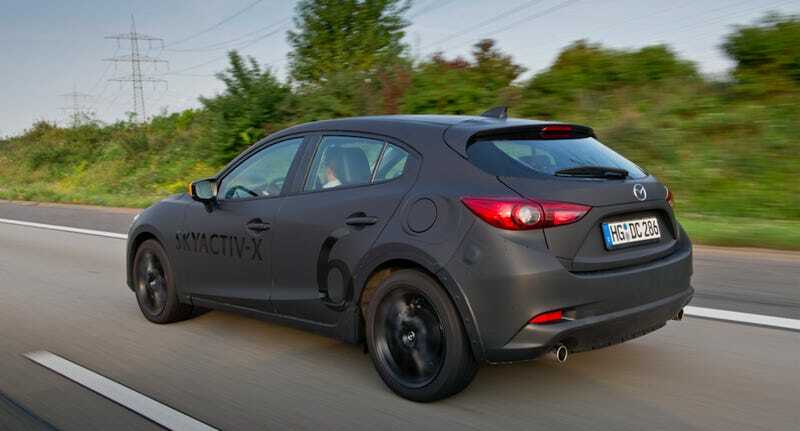 In theory, Mazda’s new SKYACTIV-X prototype engine could prove the internal combustion engine has a lot of life left in it, boasting diesel-like fuel economy in a gasoline motor that produces low emissions. But how does it work in practice? I was lucky enough to be able to drive a prototype through the streets of Frankfurt. Here’s what I learned. In early August, Mazda announced “Sustainable Zoom-Zoom 2030,” a long-term plan that includes a goal to reduce “well-to-wheel” carbon dioxide emissions by 50 percent of 2010 levels by 2030, and by 90 percent of 2010 levels by 2050. Mazda’s vision for achieving these goals doesn’t involve phasing out internal combustion engines and focusing mostly on electric cars (like other companies are doing), but rather improving ICEs and augmenting them with electric drive technologies. If they pull it off, this tiny company may prove the internal combustion engine has more of a green future than people think. Among improvements to internal combustion engines is Mazda’s new Spark Controlled Compression Ignition—or SPCCI—technology. This new combustion method, which the Japanese automaker says will be the “world’s first commercial gasoline engine to use compression ignition” when it launches in 2019, has been creating lots of stir over the last month. While I’ve explained some of the nitty-gritty details of SPCCI in another article, the gist of it is this: the new engine—which ignites a homogeneous mixture of air and fuel by compressing it with the assistance of a spark-ignited “fireball” (you can think of it as a virtual piston)—runs significantly leaner (the air to fuel ratio can surpass twice that of a typical spark ignition engine), burns fuel quicker and more completely, loses less heat to the cylinder walls due to lower combustion temperatures, and experiences lower throttling losses than a standard gasoline engine. The end result, Mazda claims, is improved responsiveness, fuel economy and torque compared to the current SKYACTIV-G gasoline engine in most Mazdas. Those are all bold claims, but some were claims Mazda was willing to back up with hardware. Specifically, the company gave me the chance to drive two vehicles: one six-speed manual transmission-equipped 2.0-liter SKYACTIV-X prototype, and a six-speed automatic version—both of which were built on Mazda’s next-generation platform. Taking off that engine cover, though, revealed Mazda’s Holy Grail motor, very clearly in its early stages of underhood packaging, but still much tidier than prototypes I’ve seen that still have another couple of years of development in them before launch. Sure, there were some weird pipes coming out of the dash, and some strange trim here and there, but here I was sitting in a car with a new platform powered by an engine I had only even heard of a month prior. The fact that it wasn’t a concoction of duct tape and zip ties was already impressive. But not quite as impressive as the way the thing drove. I was expecting the engine’s performance to be a bit rough around the edges. After all, there’s a reason we don’t have gasoline cars on the road today with homogenous charge compression ignition engines. That reason being that it’s incredibly difficult to control exactly when ignition occurs (so as to maximize engine power and avoid misfires that could cause poor NVH or even engine damage). But Mazda’s SPCCI system uses a spark plug to precisely control compression ignition, so perhaps SKYACTIV-X could avoid the pitfalls I’d been hearing about gasoline compression engines? Even so, how smoothly could Mazda transition from spark ignition needed at high engine speeds to compression ignition under normal driving? All of these thoughts went through my head before I actually got behind the wheel. But once I started driving, I was amazed by just how normal the car felt. Whether I tipped deep into the throttle, or drove steadily on the highway, the car responded quickly to my inputs with a healthy surge of torque. I piloted the car at almost 100 mph on the highway, accelerated with the pedal mashed to the floor, cruised down city streets and country roads: never did the car do anything but obey the commands from my right foot. And 99 percent of the time, the prototype sounded like a normal gas car (you can hear how it sounded in the clip below), with NVH characteristics that really weren’t too far below what I’d expect from a production vehicle. But there were two driving conditions in which I noticed the car behaving a bit strangely. The first was when I drove the car at a steady state speed for a while, and then poked the throttle to accelerate. Immediately upon depressing the pedal, a knocking noise made itself heard from the rear of the car. I noticed this only when tapping the throttle from a slow cruise, but there’s a chance the same thing happened at higher speeds, and I just didn’t notice it. The second instance that brought out the knocking noise was when I let off the gas after a heavy acceleration. As the load on the engine dropped, I heard a light crackling noise from the tailpipe. In both instances, the noise really sounded more like a slightly rattly exhaust than a severe engine knock, and I couldn’t perceive any hesitation in power delivery whatsoever. Having only driven the two prototypes for about 45 minutes each (and indeed, only with warm engines), I can’t say I’ve explored the entire realm of operating points or ambient conditions. In fact, if you look at the plots of my two drives (shown above), you can see that most of my time was spent at low engine speeds (unsurprisingly); I really didn’t drive around at the top of the tach, nor did I really give the Mazda the beans from a standstill. Regardless, during my brief drive, the car felt to me like it was 90 percent dialed in. Power delivery was smooth, NVH was decent under almost all operating conditions, and torque was plentiful. And lest you think Mazda pulled this off by just running the engine in spark ignition mode the whole time, take a look at that column on the right side of the two graphics above: over 90 percent of my driving was done in SPCCI mode. So yes, it appears that Mazda is nearly there with its gasoline compression engine. But, as one of their engineers told me when I said the car seemed 90 percent dialed in, it’s that last 10 percent—the refinement bit—that may end up being the toughest. But Mazda is confident it’ll have that all figured out by 2019.